The property, located at 750 Sleepy Farm Road, is owned by Estate Vineyards, which also owns Justin Vineyards. 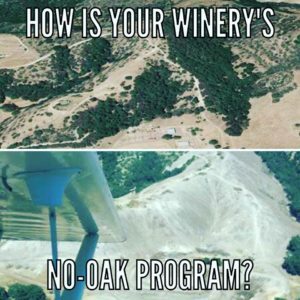 San Luis Obispo County Supervisor Frank Mecham said, in recent days, neighbors have complained about the removal of oak trees, earth moving and the construction of a large water storage pond. On Thursday morning, Mecham met with about 12 of the neighbors Thursday morning. Mecham said he told the neighbors, as well as owners of nearby vineyard, to petition the board of supervisors to adopt an ordinance that would ban the removal of stands of old-growth oak trees. Neighbors say that oak trees make Paso Robles beautiful and removing them destroys the landscape. Likewise, neighbors are concerned that the Justin Vineyard-managed project may cause their wells to go dry. Farmer Neil Heaton said he is concerned his well will go dry as a result of the pumping required to fill a 20-acre-foot storage pond. Heaton dry-farms 20 acres of wine grapes and 20 acres of walnuts on an adjacent 85-acre property. Art Trinidade, the county’s building department supervisor, said removing oaks on agricultural land is not prohibited. But, grading that occurred on the property in question may constitute a code violation. The grading took place on steep slopes, creating the possibility of erosion and creek sedimentation, Trinidade said. Code enforcement officials inspected the property Thursday morning and issued the stop-work order Thursday afternoon. The county planning department will determine next week whether code violations occurred. No worries, the Resnicks’ have us covered. No comment’s in this article have been removed 0, none. The comments on the other article going on about hitler and Obama are gone, none on this one. The County had better be prepared to up it’s budget line item for outside legal counsel. Resnick is not some yahoo with a 12 pack and a Kubota. In the absence of any ordinance, it looks like the County is hanging it’s hat on erosion control, an unfunded state mandate. Resnick has 4 months to establish erosion control measures to the satisfaction of state requirements. What’s one on the best erosion control measures? Plant the area of disturbance! The North County Tea Party and COLAB believe that you should be able to do what you want with YOUR property and that is what Resnick is doing. Save your tears in a bucket so that you can flush your toilet when your well goes dry. Restrictions on water use are SOCIALISM pure and simple.